If I had a nickel for every time I saw a comment like “I wish The Fuller Center would give me a house,” well, I’d have at least $1.85. Of course, I’ve only worked in this ministry for six years. Those who’ve been here longer likely would boast a lot more in their piggy banks. My first reaction when I see a comment like that on a social media post about the dedication or completion of another Fuller Center for Housing home — here in the United States or abroad — is frustration. However, I have to remind myself that it’s a great opportunity to educate someone who is obviously unfamiliar with the grass-roots principles behind this ministry. Of course, The Fuller Center does not give away houses. Families build in partnership with us. They commit sweat equity in the building of their homes (often alongside volunteers but also with local laborers) and pay back the building costs on terms they can afford, over time, with no interest charged and no profit made. Here is the simple concept that truly makes this ministry succeed and grow in each location: Families truly pay it forward as their repayments go into a Fund for Humanity that stay in the community and help their neighbors in need get the very same kind of hand-up into better living conditions. The families, therefore, are not charity cases but are transformed into givers themselves. This empowers families in ways that handouts cannot. Those who’ve been involved with this ministry are familiar with such pay-it-forward concepts our founder Millard Fuller developed based on partnership principles he learned from theologian Clarence Jordan at historic Koinonia Farm in the 1960s. To newcomers, however — such as those who stumble across a story about The Fuller Center and jump to the conclusion that we give away houses — this is new information. And it’s a concept they like and embrace. For those who hate handouts, they like that this is a hand-up instead. For those who are unconditionally dedicated to helping the poor, they like that families are empowered to help themselves and break the generational cycle of poverty. There’s a reason why The Fuller Center is supported by those on the far right, the extreme left and all points in between: Because no one is against helping people help themselves! The Fund for Humanity concept means that the more Fuller Center homes a community builds, the more it can build. This means that our supporters’ contributions don’t go toward just one house but many. Gifts are recycled, and home-building becomes a rolling snowball, growing along the way. 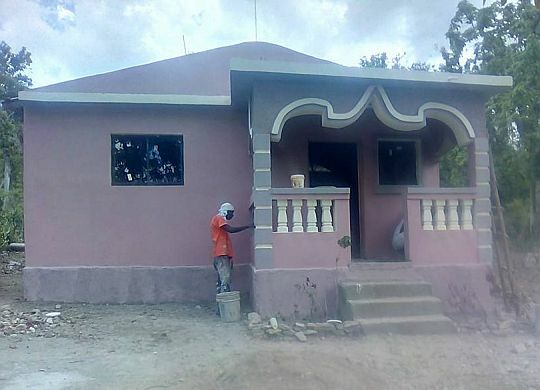 The 200th Fuller Center home in Haiti — made possible by volunteers, local workers and supporters like you — is a milestone for that number alone. But there’s more to it. Our 200th Fuller Center home in the country is the 38th in the community of Pigñon, far away from the earthquake-damaged zone where we first began working in 2010. This 38th home is entirely funded by repayments made by the partner families of the previous 37 homes in Pigñon. These repayments will fund more homes, and when these repayments are coupled with donations by people like you the success multiplies exponentially. A few of the houses built in Pigñon this year. As our Director of International Field Operations Ryan Iafigliola noted, there’s always more to every milestone number. There indeed is more work to be done in Haiti. And Nicaragua. And Nepal. And Lanett, Alabama. And Louisville, Kentucky. But in these places and dozens more across the United States and around the world, the grass-roots principles of partnership housing have taken root and allowing the pay-it-forward model to flourish.